Marble Publications & Data, Inc. (since 1995), the publisher of Inside Sesame, is well-equipped to provide a broad range of Sesame-related services to its clients, including ground-up application design, application enhancements and upgrades, programming, database conversions and system consulting. Subscribers to Inside Sesame receive discounts on all services we offer. For 13 years — from 1990 through 2003 — our principal, Tom Marcellus, served as editor of The Quick Answer monthly Q&A newsletter. (Tom is also the author of the bestselling Q&A Bible published by IDG Books.) We have been publishing the Inside Sesame monthly newsletter since January 2004 with Tom serving as its editor. Visit www.quickanswer.com for more information on our experience, technical expertise and comments from our many clients. 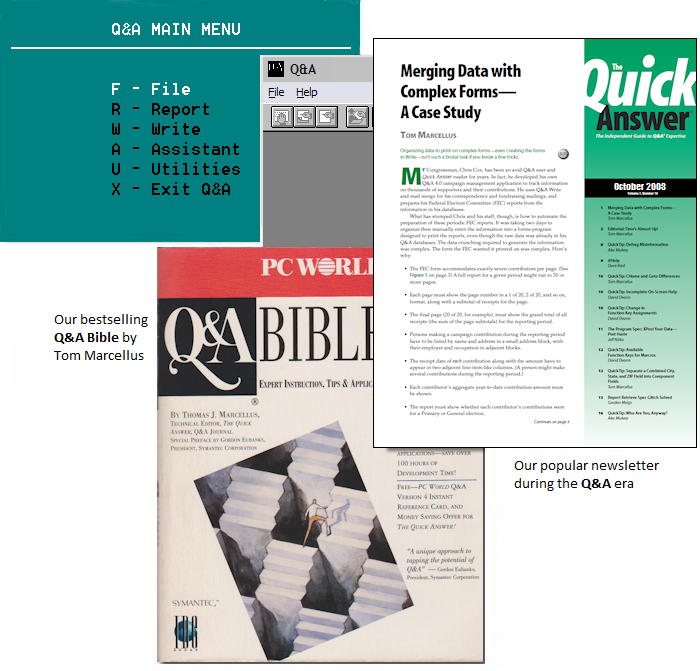 Over the years, more than 850 articles and tips on Q&A and Sesame by Tom have been published. Tom is one of the founding members of Lantica Software and has been involved with Sesame development and testing since the beginning. He contributed extensively to the initial Sesame documentation package. During these years, in addition to having our own "in-house" clients for whom we've performed extensive Q&A and Sesame development work, we've worked closely with countless Q&A and Sesame experts (other Sesame developers come to us for solutions to their tough problems) and published in our newsletters an immense range of topics, techniques, tips, tricks and workarounds for both products. Our intimate familiarity with both Q&A and Sesame is unrivalled. If you're looking for someone to convert your Q&A databases to an easy-to-use Sesame application — or to Microsoft Access or another platform, if that's your preference — we can do it for you. If you need a new Sesame database or application, but don't have the time or know-how to take on the project yourself, let us do it. If you need to add some features to your existing application, but don't know how best to go about it, we can help. If it's some minor or major programming you need assistance with, we'll work with you to get it right. If you're looking to have your Sesame data available online in any form — accessible from your web site either by validated password or publicly to all site visitors — we are a Sesame developer who also has extensive experience in web design and Web programming. Tom Marcellus created a customized contacts database that is exactly what we wanted and that has room to grow and interact with other databases as our needs evolve. He took the time to listen and understand our requirements, to make suggestions about technical solutions we would not have imagined, and to explain pros and cons of various options. We enjoyed our interactions with him, and he created an excellent product that meets our very specific needs, in a timely manner, at a reasonable cost. No more trying to fit our needs into some aggravating off-the-shelf contact manager — thanks to Tom we have exactly what works for us. My husband and I run several diverse businesses. Many of our contacts in one business are also interested in one or more of our other endeavors. We also have many personal interests and like to keep in touch with people. We wanted a Contacts database that could manage all this intersecting information in an attractive, easy-to-use, streamlined way. Tom took the time to understand our needs and used his expertise to deliver a product with which we are very satisfied. He also contributed some coaching and training tips as we went along. We highly recommend Tom for database design, training, and other Sesame consulting work. We normally charge by the hour, though we're always happy to quote a job rate when possible to do so. This way you know in advance what it will cost to have the work done. We can quote job rates because we know the product and its capabilities and because we make every effort to fully understand exactly what you need and want before we start the work. It doesn't matter where in the world you're located. Today's technologies enable us to work on and even implement your applications from our office in Southern California. When it comes time to apply design changes to your live in-use applications, we can take care of everything from here, or send you the files by email with simple instructions on how to apply the changes yourself. Sesame makes that part easy. No project is too large or small. In addition to our own proven capabilities, we can draw on an extensive pool of resources to help ensure that your job is delivered on time, on budget and on spec. Marble Publications & Data, Inc.